From a Home screen, tap the Camera icon (located at the bottom). Tap the Timer icon to select an option (on, off, auto). 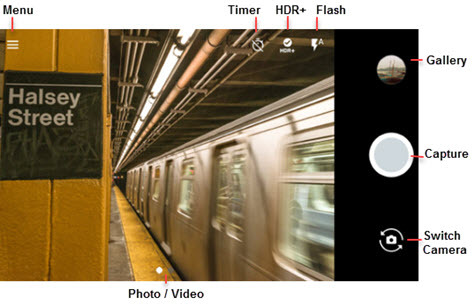 HDR (High Dynamic Range) - Combines photos or videos taken at different exposures for one optimal photo or video. Tap the Flash icon to select an option (on, off, auto). Tap the Switch Camera icon to change between rear and front camera. Allows the Volume key to perform camera functions (shutter, zoom, volume).